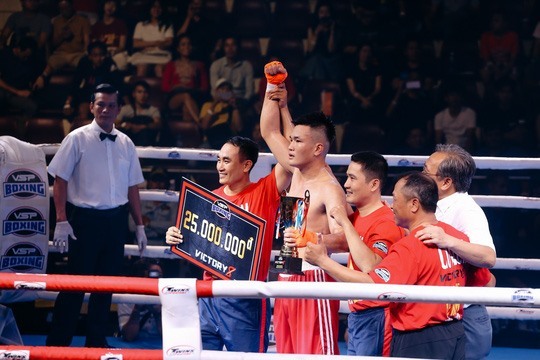 HÀ NỘI — Vietnamese boxers won five out of six fights at the international boxing event Victory 8 held in HCM City’s Nguyễn Du Gymnasium over the weekend. The second professional boxing event in the country was organised by VSP Boxing. The event attracted national champions in different weight categories to face top pro boxers from Australia and the Philippines. Cao Văn Nguyên shocked Ariel Puton of the Philippines in the men’s 57kg category. Puton is considered the “younger brother” of Manny Pacquiao with five knock-outs in professional events. Bùi Phước Tùng also beat Emmet Brown of Australia in the men’s 63.5kg category. Asian champion Nguyễn Thị Tâm crushed Gretel de Paz from the Philippines in the women’s 51kg.